From the bestselling author of The Comfort of Lies, an engrossing look at the darker side of a marriage—and at how an ordinary family responds to an extraordinary crisis. Maddy is a social worker trying to balance her career and three children. Years ago, she fell in love with Ben, a public defender, drawn to his fiery passion, but now he’s lashing out at her during his periodic verbal furies. She vacillates between tiptoeing around him and asserting herself for the sake of their kids—which works to keep a fragile peace—until the rainy day when they’re together in the car and Ben’s volatile temper gets the best of him, leaving Maddy in the hospital fighting for her life. Randy Susan Meyers takes us inside the hearts and minds of her characters, alternating among the perspectives of Maddy, Ben, and their fourteen-year-old daughter. Accidents of Marriage is a provocative and stunning novel that will resonate deeply with women from all walks of life, ultimately revealing the challenges of family, faith, and forgiveness. 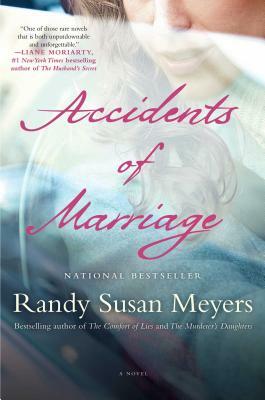 Randy Susan Meyers is the bestselling author of Waisted, Accidents of Marriage, The Comfort of Lies, The Murderer’s Daughters, and The Widow of Wall Street. Her books have twice been finalists for the Mass Book Award and named “Must Read Books” by the Massachusetts Center for the Book. She lives with her husband in Boston, where she teaches writing at the Grub Street Writers’ Center. “In successive, sensitively written chapters,Ben, Maddy, and Emma pour out their heartache and despair, eliciting compassion and high hopes from caring readers." "A deft exploration of the borders of abuse and the aftermath of tragedy, the triumphs and disappointments of recovery, and the possibilities of faith and forgiveness." "An incredibly accomplished and satisfying read, with an important message." "This family’s ordeal could not be moretimely or better rendered in this unsparing account." "Many books are an absolute pleasure to read, but slip straight from your mind. Accidents of Marriage is one of those rare novels that is both unputdownable and unforgettable. I just loved it, and I'll now read everything Randy Susan Meyers writes." "Randy Susan Meyers’s second novel is sharp and biting, and sometimes wickedly funny...but it has a lot of heart, too. Meyers writes beautifully about a formerly good marriage ­— the simple joys of stability, the pleasures of veteran intimacy ­— and deftly dissects just how ugly things can get after infidelity. The battles these women fight take place on a small stage, yet they’re anything but trivial: saving a marriage, making a meaningful career, learning to parent. In the end, thanks to Meyers’s astute, sympathetic observation, we want these women to win."